Yesterday evening, I watched as some of our Lady Lumley’s Digital Leaders essentially ran the Computing Department’s Open Evening. Our Lead Governor for teaching and learning spent half an hour talking with them and there may be an invite to talk to the governors of our biggest feeder primary – Pickering Community Junior School. Several students from PCJS immediately logged on to Makewaves and started showing their parents how they were using the site and enjoying using the social media tools with their friends. On Monday, LLS DLs will be running the Year 7 assembly and inviting up to 12 Y7s to join them as Digital Leaders in the next couple of years. 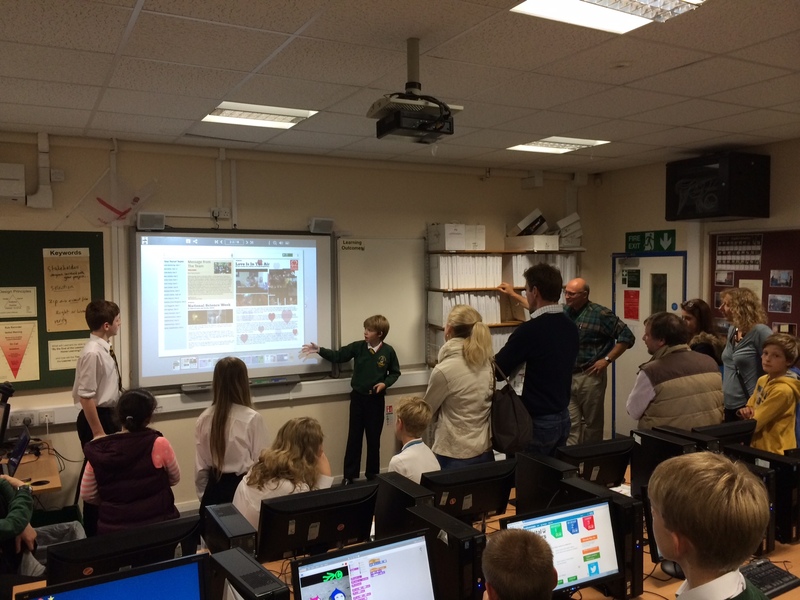 On Tuesday I visited PCJS – part of a monthly commitment this year – to see their 25+ DLs working at their after-school club and discuss with their digital leader coordinator Mrs Gow about using Makewaves with years five and six and developing the use of Level 1 #DLopenbadges to show the achievements of PCJS digital leaders. On Monday the Digital Leaders will present to the Year 7s. This will be the third year that Digital Leaders have done the recruitment – I only needed to be involved in the first year as, by definition, I didn’t have any Digital Leaders at that stage – and they do a much better job than I could do. [There is a shareable Prezi in my diary if you would like to use this as your starting point]. In fact, once you get involved with the digital leader bandwagon, it creates its own momentum in many ways. We are lucky enough to have Digital Leaders in the audience with two years experience already through the shared vision of teachers and students in our biggest feeder primary school. However, we are keen to be inclusive and make some places available to other students too – either from other feeder primary schools or maybe those who might have gained in confidence and are now prepared to make the commitment. If you look at the slideshow, you will see that LLS DLs are now understanding that every activity that they undertake is another opportunity to build evidence for their badges. In fact, a commitment to help a teacher or a Department with developing the use of a particular piece of software or hardware can give a pathway towards four different digital leader badges. The year sevens will be invited to join us for a regular weekly meeting on Wednesday lunchtime. If there are a lot of applicants I will need to use one of the application forms provided on the DLN Blog. Sometime in the next two weeks I will need all the Digital Leaders to update/fill in a new parental permission form [example in diary] for using photos and information on the variety of websites that we use as digital leaders. The new year seven Digital Leaders will need their Digital Leader lunchtime passes for Wednesdays and Thursdays too. Our first activity will be to get the new DLs to register for Makewaves. Everything you need to run your Digital Leaders is free on the Makewaves Digital Leader Network. This includes their basic membership with profile pages, creating multimedia stories, taking part in regular badge challenges, and being able to comment on their friends’ stories as well as other digital leader achievements. In addition, to support the digital leader network, and still all free – Digital Leaders have access to other Digital Leaders on the DLN Makewaves DL Network; the ability to take the missions that lead to the nine Level 1 and nine Level 2 Digital Leader #dlopenbadges and upload the necessary evidence; and the ability to seamlessly add into a Mozilla Open Badge backpack to keep with them in the future. All the evidence will be available to them in the future too. Our new ICT area – three classrooms knocked into one open plan ICT suite – has just been finished for open evening. I will need LLS DLs to organise support by them every lunchtime. Every digital leader needs to show evidence of a regular commitment over a year towards their leader badge. LLS teacher’s meet every Friday morning for 10 minutes of sharing ideas. LLS DLS have undertaken to learn WordPress (technician badge), make a tutorial (creator badge), and train the teachers (educator badge) each week so that they can post their evidence on the LLS good practice blog. For other examples of learning new software to help teachers, DLs may have have to start off by reviewing the software and thus gaining evidence towards the reviewer badge. For example, the maths department are interested in flipping their classrooms, and would like to follow the example of Dr Jones and record video clips of various mathematical teaching examples. Dr Jones uses a Mac, and is therefore keen for LLS DLS to review Windows screen recorders and then train the other maths teachers with their recommended choice. Once these initial projects have been done, the Digital Leaders are going to share the Friday briefing and ask to be involved in similar projects with other departments. 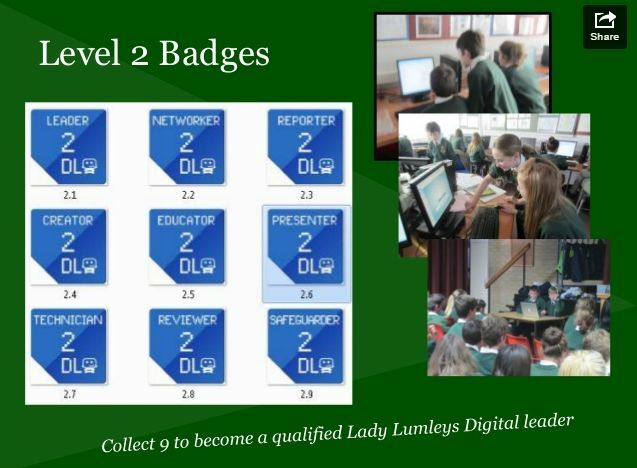 All the while, Digital Leaders use the Digital Leader badges and the associated missions on Makewaves to collect the evidence that they need to gain the eight Digital Leader badges ready for the ninth and final leader badge.